The sea. 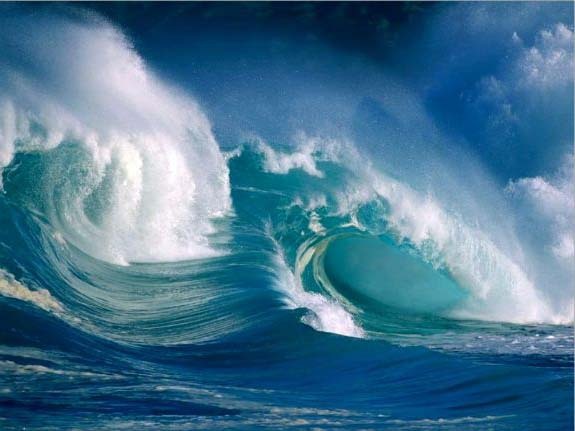 Seventy per cent of the earth's surface is covered by sea water. After conception our tiny embryo slowly grows in the sea water environment of our mother's womb. Seventy per cent of our body is water. We are children of the sea ever affected by the moon cycles and tides. From the sea, the mother of all life; comes seaweed, one of the most nutritious foods we can eat. Is a Bridge between the Sea and our Dinner Plate. She is a Highly Conscious Seaweed Gatheror and Healing Arts Expert. Trish runs a northern California seaweed business, Wild Devotion. Using sustainable and ethical harvesting practices. She wildcrafts fresh northern California sea vegetation into delicious and highly nutritive snacks, custom blended supplements and high quality culinary sea vegetables for cooking and baking. She also offers wellness consultation to illuminate issues and provide information and support to clear dis-ease, emphasizing wellness as our natural state of being. 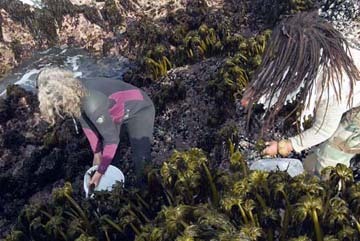 Trish has been gathering seaweeds professionally for 12 years. There were other northern Californian gatherors before her such as the Lewellens and of course the Native Americans, but none with her contemporary passion for plants and love of the sea. She walks her talk and backs it up with direct experience by risking her life to gather seaweed at the shores edge. Giant sleeper waves can appear out of nowhere and slam you down or against a rocky cliff. Seaweed covered rocks are extremely slippery. Twenty foot great white sharks live here. They can detect a drop of blood in the water from hundreds of yards away. Plant communities where wild foods and medicinals grow are vital to our existance. Super sized preditors mean a super in-tact food chain. Highly conscious - spirit driven - heart centered gatherors know there is a moon cycle and tide time to gather. Not even their shadow must pass over the plant during the harvest cut. Wildcrafted foods are always the most nutritious. Wildcrafted seaweed from Trish is the best. Trish is the one that started it all for the collective of northern California seaweed gatherors known as the Spirit Song Community. 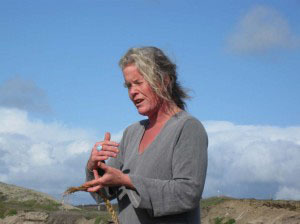 Her drive, passion and enthusiasm led her to share her knowledge and skill of the sea with the other founding members; and her commitment to work collectively led to building a sustainable business which works collectively to sustain the plant communities where wild foods and medicinals grow. Trish is also a member of the Ocean Protection Coalition, Pacific Seaweed Stewardship Alliance, Middletown Massage and Herb Collective, and Spirit Song Community. Trish is wise beyond her years. Consciously gathered Mendocino Coast seaweed is one of the best possible survival foods you could ever store (1 - 2 year shelf life) or consume. Trish has been taeching for many years at venues including The Northern California Women's Herbal Symposium and Motherland School of Herbology, Willits, CA. 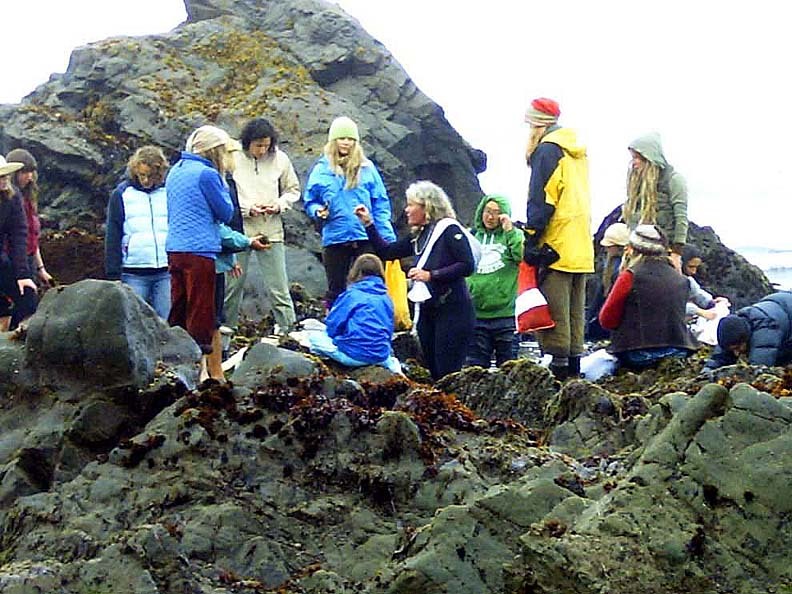 She offers classes and training in various aspects of ethical and sustainable seaweed harvest, preparation, nutrition, and medicinal preparations. MASSAGE THERAPY: Trish Gallagher blends Swedish, Esalen, Reiki, Acupressure, Trager and Deep Tissue modalities as well as Hot Stone. The goal of her massage practice is to encourage every client in sustaining a relationship with wellness. Seaweed is a Super Survival Food loaded with vitamins and minerals. The finest chefs know that when the tide is out the table is set! Seaweed is edible and can be prepared to taste delicious. It is a miraculous source of vitamins and trace elements. It even possesses the quality of removing radioactive strontium 90 (from acid rain) from our bodies. Algenic acid in seaweed acts as a binding agent to remove radiation from our digestive tract. It detoxes the body of caffeine, nicotine and many drugs. Native Americans used seaweed to comfort tooth aches by wrapping it around their gums. You can gather seaweed at low tide off the rocks in unpolluted areas of the coastline. Remove as many critters (periwinkles, bugs and shrimp) as you can off the fronds and return them to the sea. Flush the remaining seaweed in fresh water for 15 minutes at shores edge, then dump the water which puts the rest of the critters back into the ocean. Next, place the seaweed on racks for drying. Use the sun, a campfire or your oven. You can crinkle the dried fronds into small particles and place in a seasoning jar. Sprinkle at will on soups and salads or bake in breads or entries. All year long you can be benefiting from the medicinal qualities of seaweed!